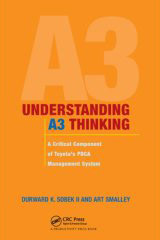 Notably flexible and brief, the A3 report has proven to be a key tool In Toyota's successful move toward organizational efficiency, effectiveness, and improvement, especially within its engineering and R&D organizations. The power of the A3 report, however, derives not from the report itself, but rather from the development of the culture and mindset required for the implementation of the A3 system. In other words, A3 reports are not just an end product but are evidence of a powerful set of dynamics that is referred to as A3 Thinking. We are excited to introduce the concept of A3 Thinking to you via this collaborative effort. In order to give you a brief sense of what this book is all about we will outline the main organization of the book below and add a few descriptive opening comments for several chapters. In addition you might want to look at the FAQ's section of this website as well as glance at the sample A3 problem solving report. In the future as time allows we'll add some sample exercises and ways for interested parties to practice their skill with writing A3 style reports. For those interested in purchasing a copy of the book please visit the direct links below on either Productivity Press or Amazon.com.